“There is nothing shorter than time, but there is nothing more valuable,” says Saint Alphonsus Liguori. In the formation of Catholic gentlemen, a well-structured daily schedule is not only indispensable, but also an obligation before God, the Creator of time. Aiming to impart a threefold spiritual, intellectual and cultural formation to its students, the Academy follows a rigorous daily schedule. Bell used to call boys to programs. As the sun begins to beam through the students’ bedroom windows, the bell-ringer strikes the bell seven times in honor of the Seven Sorrows of Our Lady. The students line up along the hallway outside their bedrooms to start the day with a prayer to St. Michael, asking his aid in the day’s battle. Punctuality for this and other formations is much emphasized, so those who are tardy often make amends by way of a few pushups. After this morning formation, everyone washes up and prepares themselves for Mass in the nearby city of Elysburg. If for some reason there is no Mass scheduled on a particular day, a rosary is prayed together in the chapel. After returning from Mass, all gather for inspection, an important practice that helps keep the students and the school building in order. Students and bedrooms must be impeccable, uniforms pressed, shoes polished, bed coverings taut and tidy. Raising the TFP Standard by Honor Guard Students. 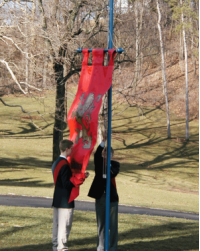 Following inspection, the students assemble before the school building for the “Raising of the Standard.” As the ruby-red standard of the TFP is hoisted, the students sing the Creed in Latin, Gregorian chant style. With a sign from an instructor, the students file out in orderly ranks for the refectory, singing Saint Louis de Montfort’s hymn We Want God. A good book like The Dreams of Saint John Bosco is read aloud while the students enjoy a hearty breakfast. Before classes commence, the flag-bearer of the week raises the national flag while the students say a prayer for America, invoking the Immaculate Conception and American saints such as St. John Neumann and St. Elizabeth Ann Seton. Every class begins with a short prayer, keeping in mind the important role the Angels and Saints have in the students’ intellectual formation. There are four periods in the morning, covering the more important subjects of Religion, English, Mathematics and History or Science. Short breaks between classes give the students time to stretch and get some fresh air. By lunchtime the stomachs of the growing young men are clamoring for attention, but they remember Saint John Bosco’s admonition, “Don’t live to eat; eat to live.” Often, a rule of etiquette or of chivalrous treatment is given at the beginning of lunch. At other times, lunch is enlivened with organized debates — sometimes heated — or a short speech by one of the older students. Students in weekly exercise class. Back in the classrooms by two o’clock, the students finish the afternoon classes and study hall. At four o’clock, the students change into their gym uniforms and run for at least half-a-mile to start off their much-needed physical exercise. A small snack follows and, depending on the day, they play organized sports or work on various projects, such as building a Nativity Scene, planting a vegetable garden, or clearing brush on the Academy’s twenty-acre property. The games help to instill sportsmanship, while the chores help the students gain a sense of duty and accomplishment. On occasion, in place of games or projects, a member of the staff or a guest gives a short talk on topics related to our Catholic faith and culture. Sometimes these talks focus on the enemies of the Church and their errors, for a good Catholic must be prepared to defend the Church. As the sun begins to dip behind the rolling hills that surround the Academy, the students pray their last Rosary together in the chapel or in the open air. Click to see larger image of Academy Choir at Christmas A candle-lit dinner follows. With lively conversation throughout, dinner not uncommonly lasts for an hour or more. Saint John Bosco once told his boys that a group without music is like a body without a soul. Mindful of this, the Academy conducts a music program which includes a brass band with percussion and a choir.Practice and/or instruction follows dinner. 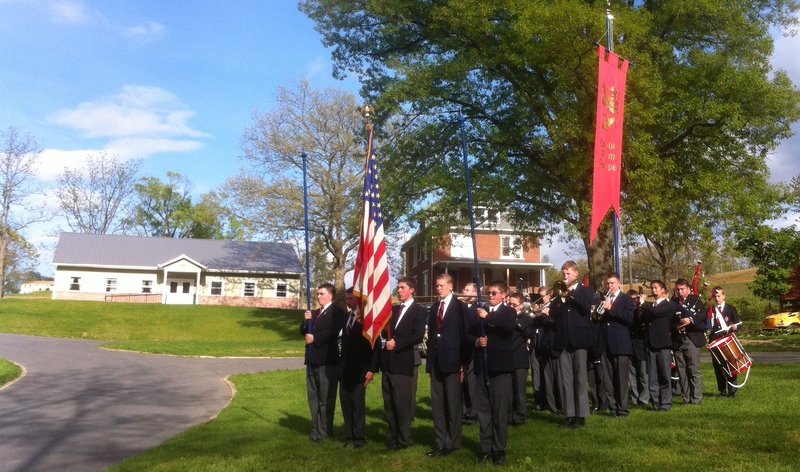 The band’s repertoire has included classical pieces such as Pachabel’s Canon and patriotic marches. The choir rehearses for the Academy’s Christmas open house or for the indult Latin Masses in Harrisburg and Hazleton. sung in the ancient simple chant. After final prayers, “Grand Silence” begins, allowing the students to get ready for bed and recollect themselves, and to read or do some homework. Before long, the hand bell for the students to be in bed tinkles, but students may read a little while longer until “Lights Out.” Then only the peacefulness of the Pennsylvania countryside can be heard…. As can be seen, there is no time for idleness at the Academy. Punctuality, esprit de corps and readiness in the context of a structured but rich daily program combine to instill a sense of order and duty in the young men, molding them into eager members of the Church Militant. 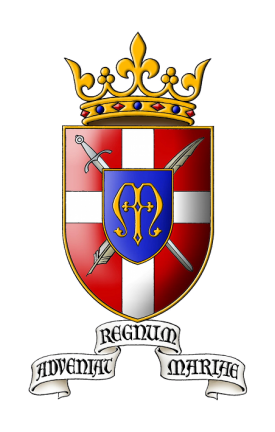 The goal of St. Louis de Montfort Academy is to provide an environment that will facilitate the healthy growth and maturity of young Catholic gentlemen. May God and Our Lady help us achieve this goal, as we take advantage of every precious moment.